When I was an undergraduate at Stanford, I gained my first experience with the analytical examination of works of art in the conservation lab at the Cantor Arts Center. The project became the subject of my honors thesis and focused on the examination and attribution of The Virgin, Child, and Saint John, a Renaissance panel painting attributed to Jacopo del Sellaio. I remember being amazed by the technologies that enabled conservators to see features and details of the painting that were invisible to the unaided eye. These imaging techniques were all the more impressive because they provided a wealth of information about the painting without causing any alteration or harm to the work of art itself. I would like to revisit this project with a discussion of three of these imaging techniques: X-radiography (X-ray), computed tomography (CT scan), and infrared reflectography (IR). Before discussing the imaging techniques, I will provide some background information on The Virgin, Child, and Saint John. As was typical during the Renaissance, Sellaio executed the painting on a wood panel coated with gesso. Gesso is a mixture of animal-based glue and chalk and provides a smooth, even surface for the subsequent paint layers. Before applying the paint layers Sellaio made a preparatory underdrawing on the gessoed surface of the panel. This initial sketch laid out the overall composition of the work, positioned figures, and provided a general template for the final composition. He then created the scene using paints made from ground pigment mixed with egg yolk. 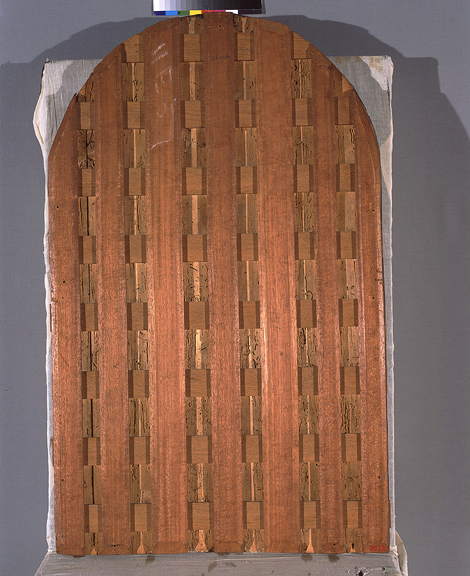 The X-ray of the Sellaio painting reveals that the wood panel support is composed of three wide boards and possibly one smaller strip of wood. The gaps between these boards are visible as thin, vertical white lines running through the image below. No nails, dowels, or other types of mechanical joinery are visible at the junctions between the boards, indicating that the four pieces of wood are attached to each other with glue. However, in the top-right corner of the X-ray we can see two nails that were driven into the side of the panel in an effort to repair a split in the wood. 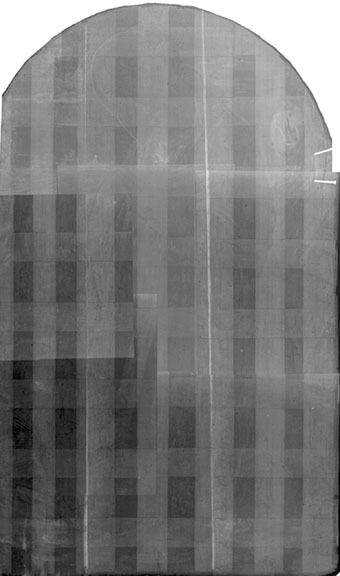 Additionally, the large “basketweave” pattern that is visible over the entire X-ray image is the result of the cradle that is attached to the back of the panel. The cradle was probably added many years ago in an attempt to mitigate warping of the wood support. A CT scan captures a three-dimensional picture of the object by integrating X-ray images taken of the painting at different angles. In the case of the Sellaio panel, the CT scan shows higher resolution images of many of the features of the X-radiograph. The CT scan also provides an extremely detailed view of the panel’s surface topography, allowing us to look at how the paint is built up on the surface. Another feature we can readily see in the CT scan images is the presence of insect tunnels in the wood panel. In fact, fly-though movies of the CT scan allow us to “follow” the insect tunnels along the grain of the wood in the boards. Infrared reflectography (IR) enables us to look just below the paint layers for a glimpse of the underdrawing. 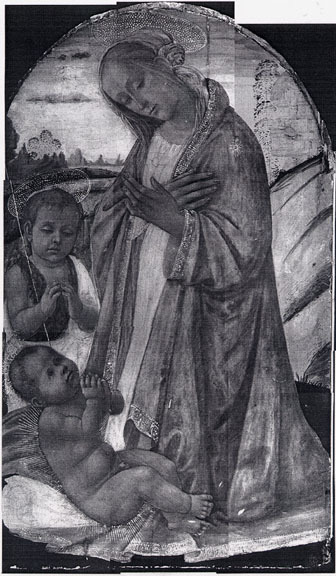 The underdrawing of The Virgin, Child, and Saint John has a loose, sketched quality that indicates it was drawn freehand. This insight into the working technique of this particular painting tells us that the composition was probably not pounced, traced, or otherwise transferred from a pre-existing sketch. The underdrawing also shows us how Sellaio planned certain aspects of the work. 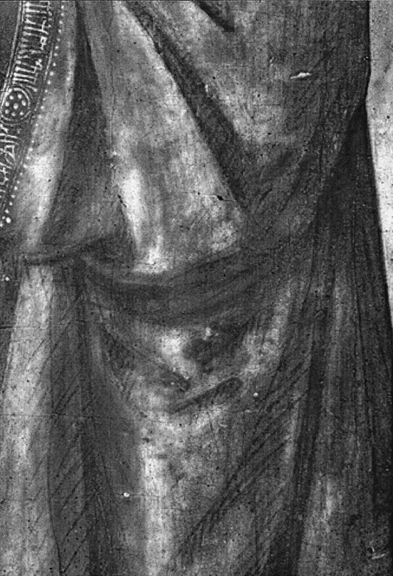 For example, the cross-hatching on the Virgin’s robe provide evidence that the artist deliberately laid out the shaded areas of the drapery. Interestingly, underdrawings sometimes differ from the final painted composition. In some cases the differences are substantial, with large changes in the arrangement of figures or other features of the painting. In The Virgin, Child, and Saint John, the changes are less drastic but nonetheless give us information about Sellaio’s “first draft.” Perhaps the most prominent change concerns the clasp on the Virgin’s upper chest. 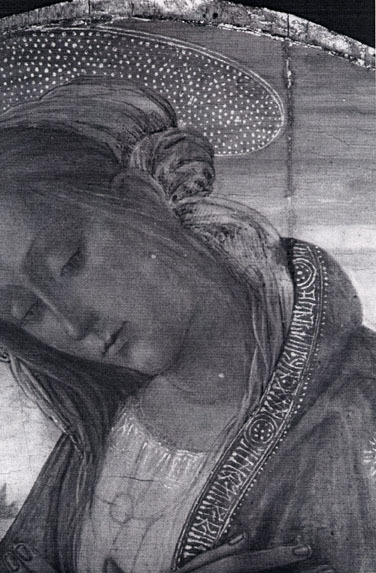 In the underdrawing, the clasp appears to connect the two sides of the Virgin’s robe; however, this feature is absent in the final painting. 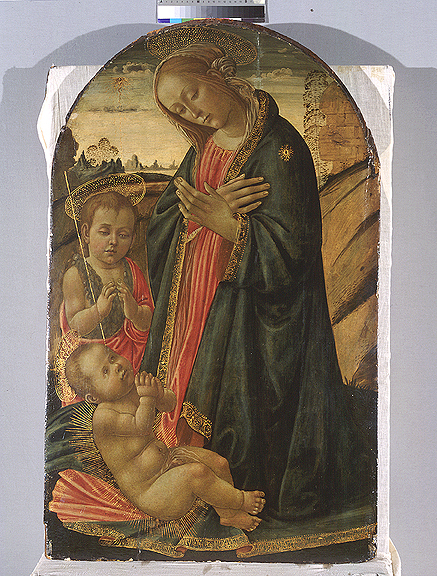 The imaging techniques used to investigate The Virgin, Child, and Saint John offered many insights into how the painting was made and how it changed over time. These techniques are also emblematic of the insights that art conservation provides through its emphasis on collaborating with the sciences.